There’s one thing you need to know about me, if you haven’t figured it out already. 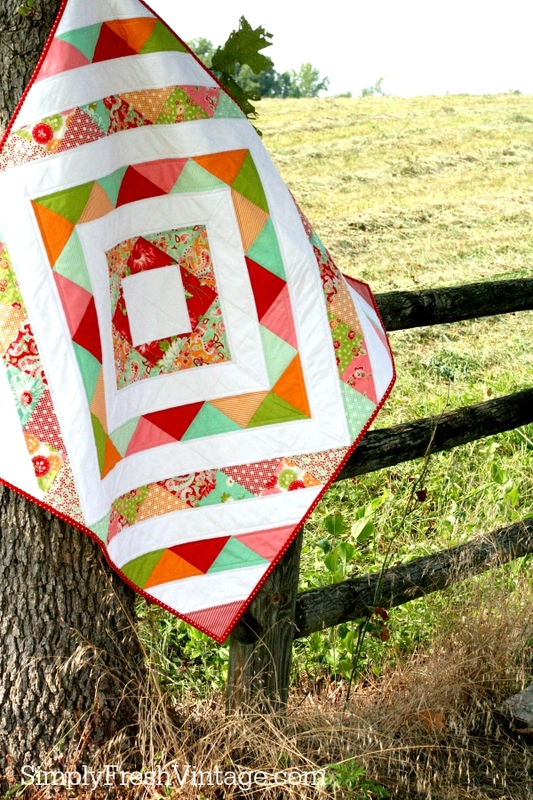 I LOVE QUILTING … everything about it, every single part of the process. From designing the quilt pattern, to picking the fabric, cutting it out, marking pieces if needed, assembling the blocks, and yes, I even love attaching and hand-stitching the binding. Seeing a finished handmade quilt on the back of my couch gives me warm fuzzies. Seeing my hubby or one of my kids snuggled under one of my handmade treasures makes my heart melt, even more so when they’ve picked a common favorite and argue over who gets to use it. 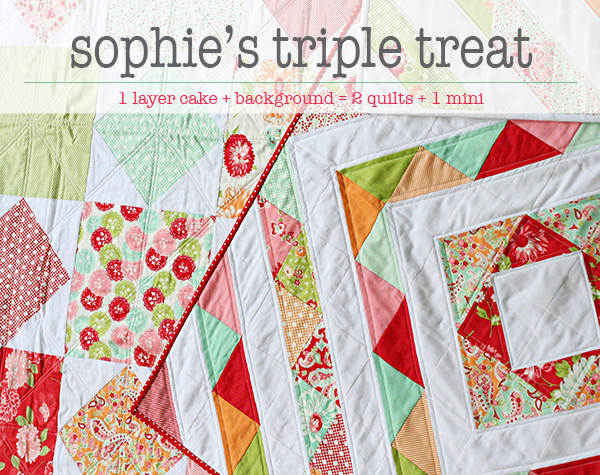 I have especially enjoyed dabbling with designing my own patterns and today I have a brand new quilt pattern to introduce … Sophie’s Triple Treat. If you’ve been following along on Instagram lately, you know that I’ve been working on a very special quilt pattern. Earlier this year our daughter and her family moved from California here to Virginia. It has been so much fun having them close by, especially since they are the parents of our only two grandchildren. The oldest has popped in for visits to the blog here and there as my special little helper. Today you get to meet the youngest, now 8 months old. We are completely loving every moment watching him learn to roll over, sit up, crawl, put everything in his mouth that he isn’t supposed to, etc. A couple of months ago, we were all very surprised to find out that grand-blessing number 3 will be joining us late January. It’s a completely new season for us and we are embracing it and loving every single moment of it. Of course, this also means that new quilts are needed! My daughter picked up one of my layer cakes one evening, sat down with a sketching tablet and began to draw out a quilt pattern. It was a very simple pattern and as I started working with it, I realized that there was enough left over from the original pattern to make a second quilt and a mini. I decided to put it all together into a pattern. 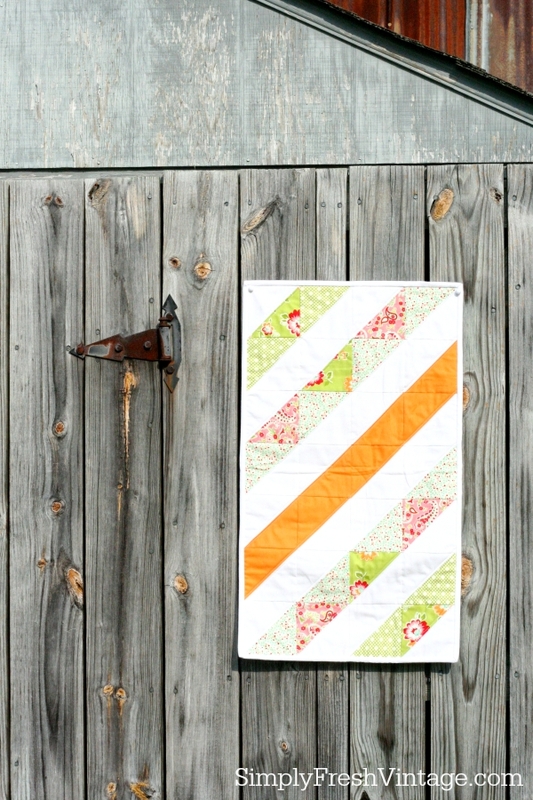 I love how the simplicity of the quilt pattern brings out the wonderful colors and designs in the individual fabric pieces. This is a great pattern for beginners and these projects all go together very quickly. All three projects are made with one layer cake (42 – 10″ squares) and 2 yards of background fabric (white/cream), plus batting, backing, and binding. I’ve given several alternative layouts for the half-square triangle quilt and the mini. I’ve also included diagrams for how I machine-quilted my projects. 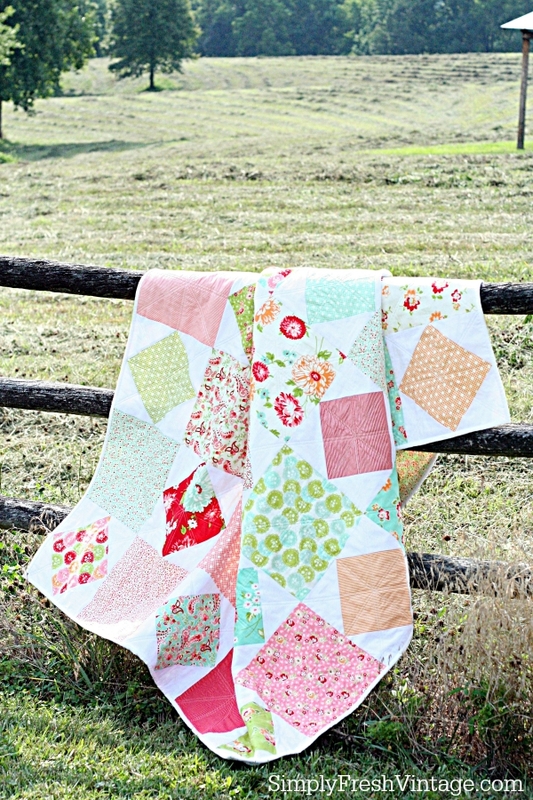 You can easily finish one of the lap quilts in a day. 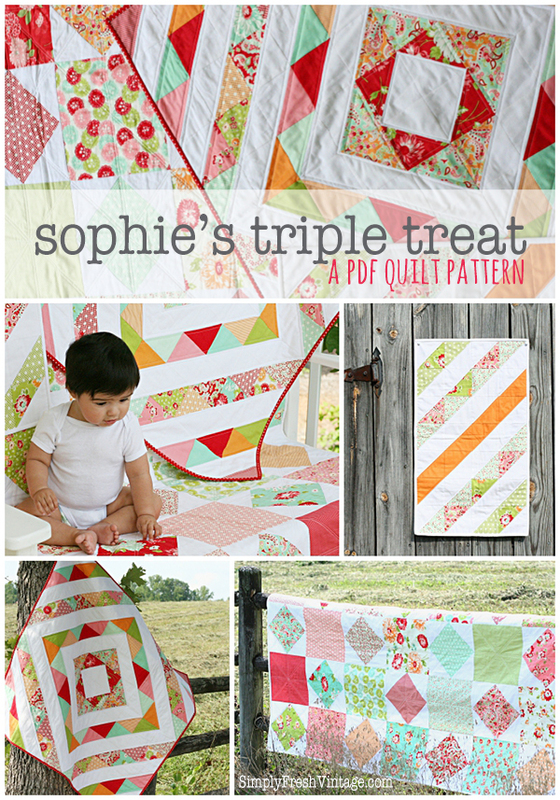 As a special treat for my quilting friends, I’ve set a special introductory price for the pattern. This special pricing is only available through the end of August. The downloadable PDF pattern is available on both Craftsy and Etsy. I would love to see the projects that you make with this pattern. You can send pictures to me at lani (at) simplyfreshvintage (dot) com. I just found you on the Framework group page. I am going to become a Nonna this summer and in a couple weeks will find out the gender of the baby…I want to make a quilt for the baby. I am thinking it is small. so there is a chance I can really do this. My grandmother quilted non-stop. My mother sewed all of my clothes and so when I got a sunbonnet quilt as a young girl I was able to point out each fabric and remember what the outfit was that my mom had made me from it. 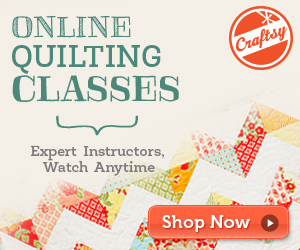 I am excited to have found someone so passionate about quilting…an expert, indeed! I will look forward to learning. Lastly, I am new and as I filled out the conversation I see all of my posts loaded below this comment from my website. I have never seen anything like this before and it is not my intention. If you know what I need to do to make them go away let me know. Congratulations on your new grand-love! Our 3rd was born just a few weeks ago … an incredible blessing. 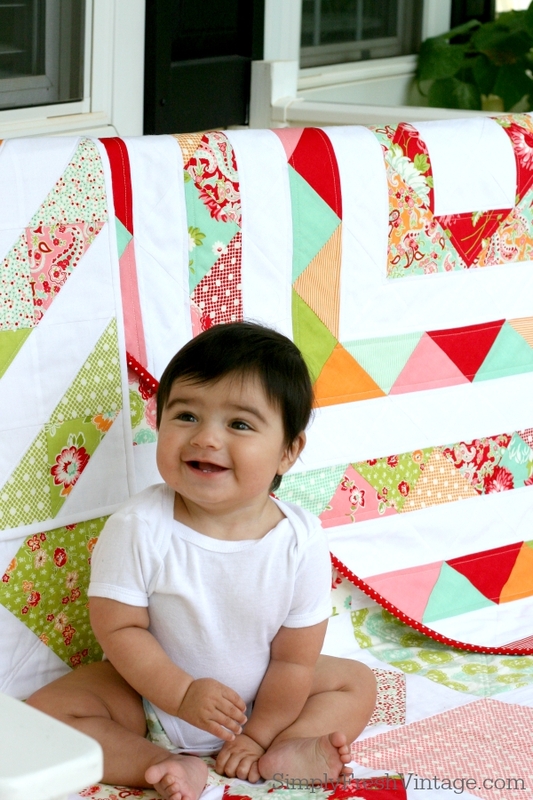 Let me know if you need any help making your quilt. I’m more than happy to assist in any way I can. You mentioned that when you left a comment, you noticed that it listed your own previous posts. I use a free plugin called “CommentLuv” for that. 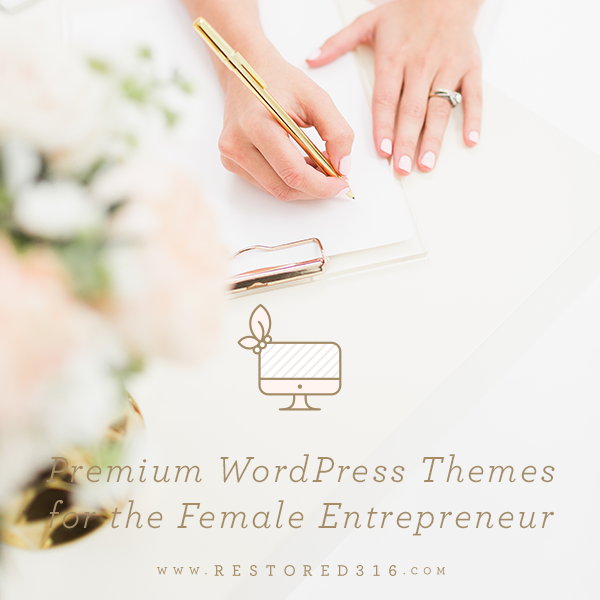 It’s a great way for cross-promoting when you leave comments on other’s blogs. Stunning! Just the kind of quilt pattern I was looking for! Oh your quilts are scrumptious! So cheerful and fun….love them. I’ve been trying to quilt but the heat has had me kinda sidelined….though I did manage to get a few table runners done. The weather in California has been awful. I lived there for almost 50 years. I was talking with my sister-in-law today and she said it was 108 where she is in Northern California. I remember those days all too well! Praying that the heat subsides and the rains come! Your blog is lovely 🙂 You have a new follower!